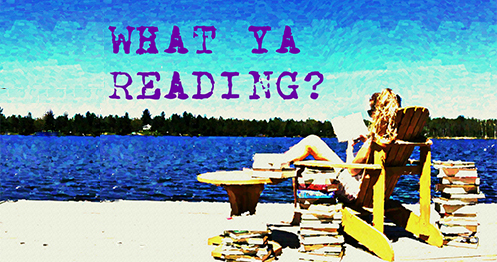 The Immortal Rules | What YA Reading? In a future world, vampires reign. Humans are blood cattle. And one girl will search for the key to save humanity.”Allison Sekemoto survives in the Fringe, the outermost circle of a vampire city. By day, she and her crew scavenge for food. By night, any one of them could be eaten. Okay, folks, I know what you’re all thinking. Another vampire book. Another freaking vampire book has taken the freaking pop culture-based stage and what the frig is Julie Kagawa– Julie Kagawa, of all people!— doing writing about our fanged little friends? Well, folks, this may come as a bit of a shocker to you, but this is no ordinary vampire book. No, The Immortal Rules is anything but ordinary, mainly because in addition to vampires, it involves preacher boys, raving lunatics, and foaming zombie hybrids. An epidemic of a disease know as Red Lung has destroyed the majority of the human population. To protect what is left of it, along with its own race, the vampires formed cities. Registered humans now exist as blood cattle and slaves. Unregistered humans, however, must scavenge for food, territory, and shelter– all of which is scarce within the city limits. However, outside of the city walls, zombie/vampire hybrids known as rabids run rampant, threatening to convert all of those who cross them with one bite. Allie, an Unregistered, is attacked while attempting to survive. She has no other choice than death. However, how she dies is up to her: will she be killed for good… or will she wake up with with fangs in her mouth and blood lust in her heart? Obviously, Allison will choose to become a vampire– otherwise there’d be no plot. But why will she do so? What could cause her to desire to become the creature that she hates the most? And what will happen once she does? The world building in The Immortal Rules is very well done. From the Inner City to the Fringe to the ruins to what’s beyond them, I was thoroughly engaged in this post-apocalyptic world. Maybe it was the zombies, or the overgrown towns, or the fact that all of the events take place only at night. No, it was definitely the zombies. The only thing that I would have changed about the world building is the Floating Pit, because I just couldn’t picture it. My favourite character in The Immortal Rules is Kanin, Allie’s tortured vampire creator. I love him. No, seriously. I don’t even care that his name is Kanin. (Just pause for a second and absorb that. Kanin. Kay-nin.) He’s brutally honest when it comes to vampire nature, but is self-deploring and loathful of the monster he claims all vamps to be. I love the way he can basically condemn the fate of his species without so much as flinching. Although he’s made a few very large mistakes in the past, I can’t wait to find out more about him. I really hope that he plays an important role in more than one quarter of the next installment. I don’t want to give anything away, but I also think that a certain vampire king is pretty hilarious. Did you burn down my theater? That wasn’t very civilized of you. Now I’m going to have to find another spot to hold the ritual dismemberments. Ah, yes, the ritual dismemberments. How could I have forgotten about those? Characters I didn’t like as much include Allie and Zeke, the protagonist and love interest. Allie is what I like to call an Obstinately Strong Female Protagonist. She’s strong, great with a sword, and comes up with racy comebacks. However, she’s also somewhat of a shrew, being pig-headedly stubborn and self-centered. Dear Allie, you being a scary vampire doesn’t change the fact that if you’re a hellion who swears like a truck driver, people will dislike you. It’s just what people do. I mean, you’ve got some opinions, and that’s cool with me– unless they’re stupid opinions. Like yours. And what’s with the fact that Allie is the only competent female character? All of the other girls are either too old to survive on their own, too young to survive on their own, raving and crazy, or jealous beeyatches. ‘Cause that’s reassuring when it comes to female niceties. Zeke is Allie’s polar opposite. His name is actually short for Ezekiel: the name of the angel of death. This is strangely appropriate; Zeke has no flaws. He’s perfect. He always sees the good in people, is ready to give without expecting anything in return, puts himself in danger for the well-being of the group, is the son of a preacher boy, is beautiful on the inside and out– am I annoying you yet? Yes? Try reading a whole book about him. The idea of the star-crossed romance between Allie and Zeke is not new. Nonetheless, as is her fashion, Kagawa spins this over-told tale extremely well. She doesn’t grant readers the satisfaction of an easy love story, instead choosing to stay true to her characters and their natures. The romance between Zeke and Allie just suits them. Although, I fail to see how someone like Ezekiel could ever fall for someone like Allison. But that’s his problem. On a lighter plot note, Kagawa keeps her readers riveted with all the action going on in The Immortal Rules. I’m telling you, this book is intense. I mean, maybe all 485 pages weren’t terribly necessary, but it’s a feat in itself to write a 485 page book that’s highly addictive. Oh, and one more thing: unlike the girl depicted on the cover, Allison is Asian. Thank you, Julie Kagawa. Thank you. 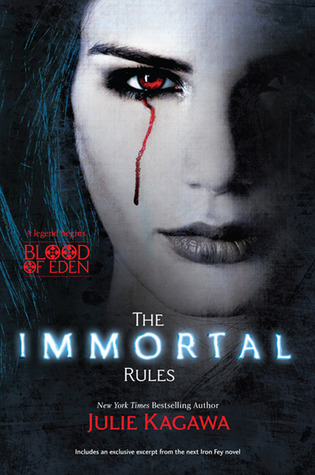 The Immortal Rules merits a good 3.9/5 stars. For fans of zombies, vampires, and multicultural literacy.